With China’s assault on scores of leading academics and intellectuals, business as usual is no longer possible, writes Magnus Fiskesjö. 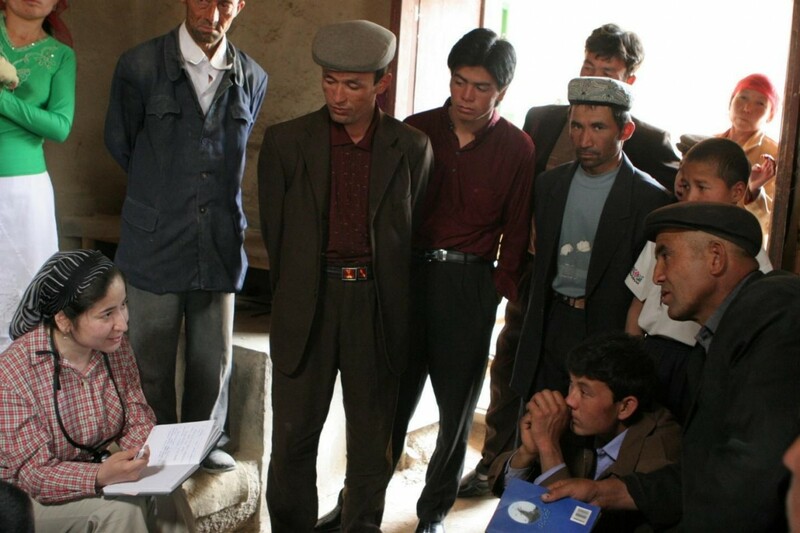 PHOTO COURTESY OF LISA ROSS: The Uighur scholar Rahile Dawut conducting ethnographic research. The recent mass arrests of scores of leading academics and intellectuals in western China is one of many indications that the Chinese regime’s current campaign against the native Uighur, Kazakh and other peoples is already a genocide. It is now clearly engaged in “acts committed with intent to destroy, in whole or in part, a national, ethnical, racial or religious group, as such,” as defined in the 1948 international Convention on the Prevention and Punishment of the Crime of Genocide. The Chinese regime is clearly carrying out such mass arrests of famous figures, alongside hundreds of thousands of “ordinary people,” to destroy the dignity and very identity of these indigenous peoples. To achieve this goal, the regime goes after the most admired artists, writers, academics, poets, clerics, athletes and so on. These proud icons are all being sent to lawless brainwashing camps. There, according to numerous eyewitness testimonies, they are forced to denounce themselves, their very professional and personal dignity, and bow to prefabricated verdicts of being “two-faced” secret radicals — even though they are long-established, decent, proud leaders of their people. The detainees are all there on the say-so of the Communist bosses, who are in some cases even filling the camps by quotas. Perhaps the most famous Uighur singer and troubadour of all, Sanubar Tursun, was to have performed at an international music festival in France in February. Her cancellation was announced from the stage — she “disappeared” last December. The reason can be nothing other than the great respect for her among her own people. She’s also internationally famous and has performed alongside her Chinese colleague the pipa artist Wu Man. But as with the others dragged off, most likely to the camps, we do not know where she is or what she would be accused of. The many famous intellectuals are clearly targeted personally. They include the beloved native anthropologist and folklorist Rahile Dawut, picked up as she was leaving for a conference in Beijing; Qurban Mamut, a leading journalist and editor of one of the region’s foremost state-approved magazines; and Tashpolat Tiyip, an internationally noted expert on desert climate and, until his arrest, president of Xinjiang University — said to have been sentenced to death. Why? Please watch the music video “Dear Teacher,” from 2016, by ultrafamous Uighur pop singer Ablajan — now also in the camps. You’ll see proud schoolchildren confident in their future as both ethnic and modern, learning Uighur as well as Chinese and English, science as well as traditional courtesy. It’s an optimistic Uighur identity. But that is exactly what the regime is targeting: schoolchildren are now prohibited from even speaking their language in school; native customs and everyday religion, down to funerary rites, are being eradicated. The trauma and fear of internment and death among all the 12 million native peoples in Xinjiang is now compounded by the fact that nobody can sing either Sanubar Tursun’s passionate tunes or Ablajan’s proud new pop. All are being silenced. This is genocide. It already meets all five of the convention’s statutes: killings; massive mental harm inflicted on entire peoples; prohibitions on native languages and customs, forced assimilation to Chinese ways, including forced violation of food taboos; termination of pregnancies and forced marriages of native women to Chinese men; and the systematic confiscation of children from detained parents. We know about Xinjiang in great detail now, thanks to scholars and journalists excavating the truth from satellite imagery, the Chinese internet and the testimonies of numerous witnesses. The Chinese regime is now trying to engage in damage control. After first denying the existence of their new gulag, since October 2018 they have acknowledged it, but much like the Nazis, they try to pretend it’s about “vocational training.” That would be laughable if not for the tragedy of the likes of Sanubar Tursun, Rahile Dawut, Tashpolat Tiyip and the many others. Yet our universities’ exchange programs with China, “centers” in China, joint research projects and the like are proceeding as if there’s business as usual, and, it seems, doing so no matter how many top academics or indeed ordinary people are extralegally imprisoned and their cultures systematically demolished. I know of only one university that has formally spoken up: the Université Libre de Bruxelles. China can no longer be regarded as an authoritarian country that is perhaps moving in the right direction. No, we are witnessing a monstrous mass assault on human dignity. It is an intentional, well-planned, multipronged genocide, targeting the dignity of whole peoples and cultures by humiliating their best and brightest, including our fellow scholars. Just as it was under Hitler and Stalin, the logic of mass extermination of those defending their culture may not be far off. If our colleges and universities are really bulwarks defending human dignity — not just corporations in search of profit-generating, apolitical “excellence” — they cannot be silent and pretend as if we can have business as usual in the third year of this horrific Chinese genocide. Magnus Fiskesjö is an associate professor of anthropology at Cornell University. He is also former cultural attaché at Sweden’s Embassy in Beijing and former director of the Museum of Far Eastern Antiquities in Stockholm. Posted in Culture, Politics	Bookmark the permalink.